Star Lake Fishing Resort has a beautiful wilderness setting only nine km. west of Clearwater, British Columbia, Canada. We offer cozy cabins, private campsites, and complete boat rentals. 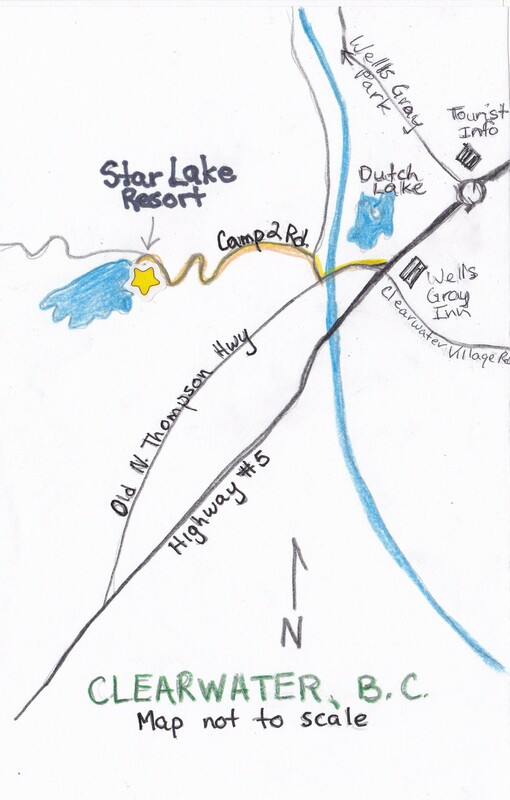 To get to Star Lake Resort follow the Yellowhead No. 5 Highway through the beautiful North Thompson Valley to the friendly little town of Clearwater, just 120 km north of Kamloops, BC. 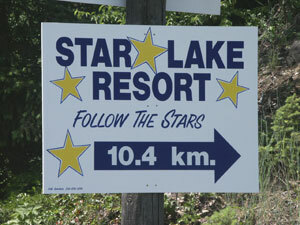 The scenic 10 Km (6 mile) drive from Clearwater to Star Lake Resort takes 10 to 15 minutes. The all-weather road is suitable for RV’s or cars. In Clearwater, turn onto the Old North Thompson Highway at the Wells Gray Inn intersection. 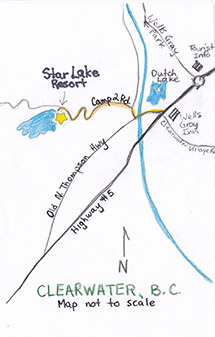 Drive past Dutch Lake, cross over the Clearwater River, and turn onto Camp Two Road. Drive to the end of the pavement (.5km) and turn left at the “T” in the road. You will see our sign on the right and then just FOLLOW THE YELLOW STARS.